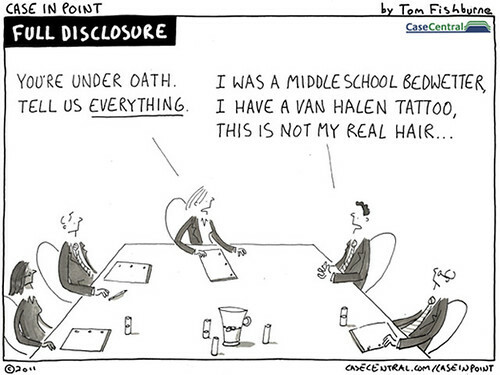 Does “full disclosure” really address conflicts of interest? Actually, it may make things even worse. Disclosure doesn’t solve problems the way we think it does, and in fact it can actually backfire. Coming clean about conflicts of interest, they find, can promote less ethical behavior by advisers. And though most of us assume we’d cast a skeptical eye on advice from a doctor, stockbroker, or politician with a personal stake in our decision, disclosure about conflicts may actually lead us to make worse choices. People with a conflict gave biased advice to benefit themselves. But the twist came when the researchers required the experts to disclose this conflict to the people they were advising. Instead of the transparency encouraging more responsible behavior in the experts, it actually caused them to inflate their numbers even more. In other words, disclosing the conflict of interest — far from being a solution — actually made advisers act in a more self-serving way. « Are tragedies worse when we feel responsible — or when we don’t?